On Christmas Day 2016, the Baltimore Ravens were eliminated from both the possibility of earning the AFC North championship and a spot in the playoffs when Pittsburgh’s Ben Roethlisberger and Antonio Brown combined for a game winning touchdown with nine seconds left to play. In the days following the game, some Ravens fans directed their ire at head coach John Harbaugh and his staff, asserting that the group should be terminated, for, among other crimes, poor clock management. Sound familiar? Training Camp for Fans Part Eight: What is the Steeler Way? Pittsburgh was the Silicon Valley of the Industrial Age. That was the assessment of Howard Fineman, Global Editorial Director of the AOL Huffington Post Media Group, and former Senior Editor of Newsweek. I have never had the pleasure of meeting Mr. Fineman, but we have at least three things in common: We both had newspaper routes selling the now defunct Pittsburgh Press, attended and graduated from the same high school, and wrote articles for the inaugural edition of another defunct publication the Steelers Annual. Fineman made the Silicon Valley reference in his Steelers Annual piece. Over the years I have found myself constantly comparing this to another statement that disguises extraordinary complexity behind a façade of deceptive simplicity. Speaking thirty years ago at the National Press Club in Washington DC, writer James Baldwin was asked what needed to be done to effectively address race relations. His response: America needed to grow up. A few weeks back I wrote about the stated goal of the offense to score at least 30 points per game in light of what they actually did last season. 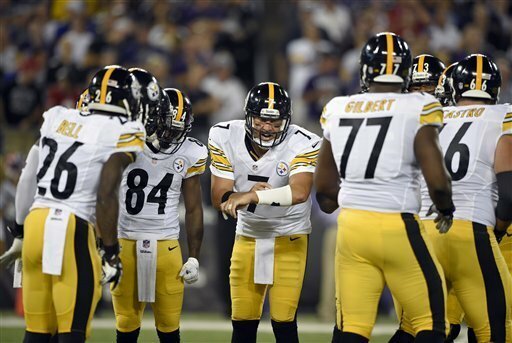 Had Ben stayed healthy it isn’t crazy to think they could have done it, although the stinker of a game quarterbacked by Roethlisberger in Baltimore does give one a slight pause. But the offense has just upped the ante, and now they wish to not only score 30 points per game but average 5.0 yards per carry. A year ago without running back Le’Veon Bell for 10 games (injury and suspension), center Maurkice Pouncey for the season and tackle Kelvin Beachum for a significant portion of the year, the Steelers rushed for 4.4 yards per carry, which was eighth best in the league.